At an old antique barn-wood kitchen table, Brian (45) unshaven, ragged Polo t-shirt and shorts, drinks a double espresso. His WIFE (34) a petite blonde with bright blue eyes, works on her laptop prior to leaving for the day ahead. Choosing the title of this Blog to be a play on the title of the long-awaited sequel to Chinatown was an accident. I have to be honest. I thought it was funny and catchy, that’s all. I never really liked Chinatown that much, and The Two Jakes is about the same for me. I know, I know, blasphemy for a screenwriter. Both movies have grown on me though since I started writing. But then I started to think about it carefully, and the The Two Cheeks seems appropriate for this blog in many ways. Roger Ebert in his review of The Two Jakes wrote: “The movie really is about the values that people have, and about the things that mean more to them than life and freedom.” I like that. My scripts are very similar. I write stories about people torn between their values, love, and their past or future. Heavenly Betrayal: a man whose passion is at odds with his calling, and must choose between his faith, his country, and his love. Fool’s Heist: a man who risks his friendship and freedom to try and fill a void, one he eventually learns can only be filled with love. Vengeance Beloved: a man who lost it all and now must choose between a positive future or revenge for the past, but is blinded by passion. 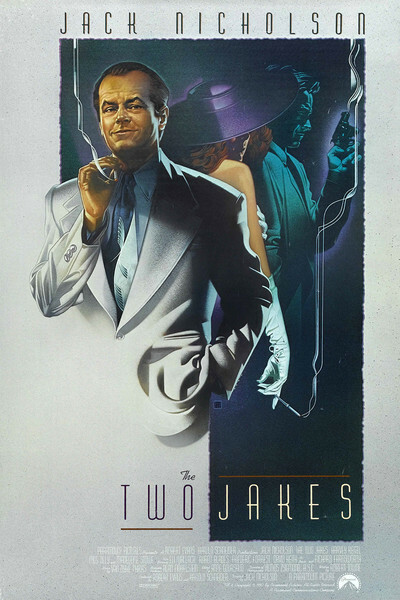 My movies are about men like Jake Gittes, someone who we can all relate to at some point in our lives. So that’s one reason I’m keeping the title. Hope you enjoy the Blog.